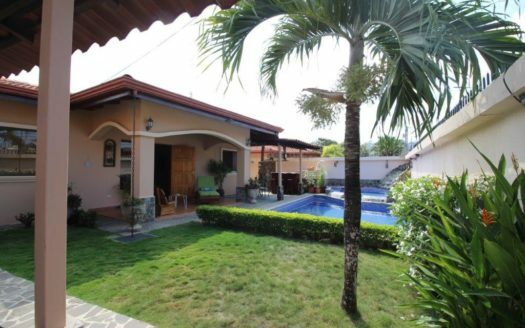 Beautiful Jaco Beach Home For Sale in Hacienda Jaco, Costa Rica! BEAUTIFUL Jaco Beach Home in Quiet Location with huge yard. BEAUTIFUL Jaco Beach Home for sale in Hacienda Jaco! 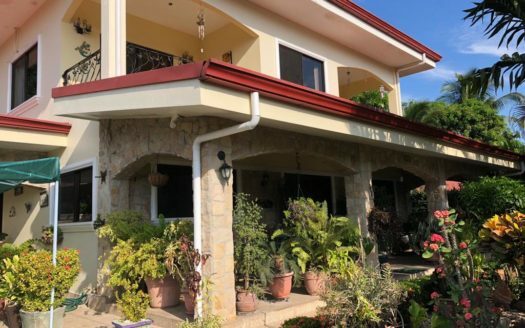 Featuring one of our most unique, stylish homes in a quiet, hidden area of Jaco, with GREAT POTENTIAL due to the huge yard and layout of this charming home. Homes with this kind of huge front yard are very rare in this area. Enter the compound-style high walled entrance of this very private property into a setting of privacy and beauty. There is a large front yard area of cultivated green grass, an ideal area for installing a rancho, additional homes or pool/cabana area. Against the back perimeter of the 767 square meters (8253 square feet) lot is the home. Spacious tiled veranda/porch areas grace the front of the house, perfect for enjoying Costa Rica’s year round beautiful climate. Stylish glass- paned wooden doors lead from the veranda to the large primary living space with open floor plan. This section of the property is all on ground level. There is a huge kitchen and two bedrooms with shared bathroom in this original section of the home. There is an additional “lock off” area directly accessed from the living room or patio. This amazing addition to the original house acts as an adjoining apartment or master suite, and features downstairs living area with large kitchen and a large master bathroom upstairs with en suite bathroom and balcony with views down below to the spacious yard. The house was built with steel reinforced concrete block, varnished wood (teak) finishes accent the high vaulted ceilings, giving the property the look and feel of a rustic Colonial, Hacienda-style property in the tropics! 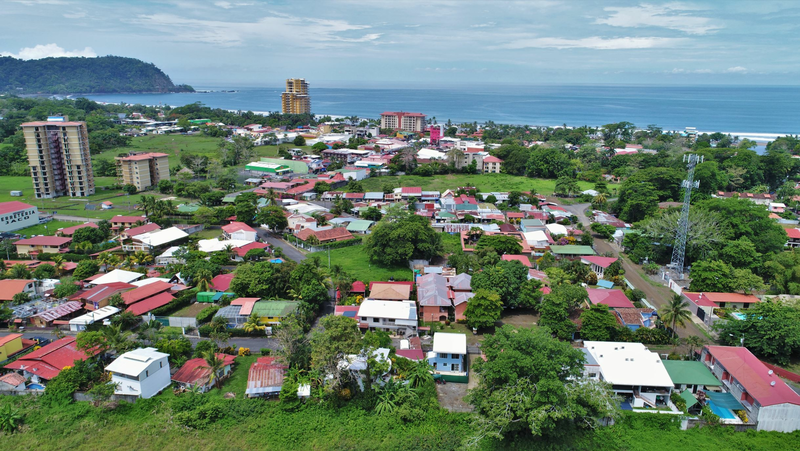 This location is a short 1/2 mile from Jaco beach and close to Jaco Central, yet maintains its “Natural Costa Rica” feel, with plenty of beautiful trees, flora and fauna, and is quiet and private. Please call for more information or a tour.